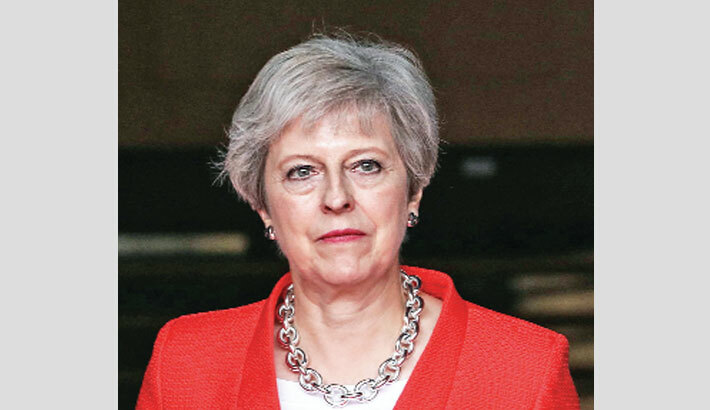 LONDON: British Prime Minister Theresa May vowed Sunday to stand by her blueprint for future trade ties with the European Union, amid fierce opposition from Brexiteers and doubts from the bloc, reports AFP. May in July unveiled a government paper that envisages Britain leaving the single market but staying in a free trade area for goods and agri-foods, through a customs deal and common rulebook with the EU. Dubbed the Chequers plan after the country retreat where it was agreed by her cabinet, the proposal met immediate opposition from her own ruling Conservatives, who think it keeps Britain too closely aligned to the bloc. It sparked the resignations of then Foreign Secretary Boris Johnson and former Brexit Secretary David Davis, while EU leaders have repeatedly questioned its viability and said further compromises will be needed. Britain is set to leave the EU on March 30, and the two sides are entering a period of intense negotiations as they try to strike a divorce agreement by late October to give their parliaments enough time to endorse a deal. Facing a strengthening campaign among Brexiteers against her plan, May reiterated she would opt for no deal rather than make further concessions to Brussels. “For some sectors there would be real challenges for both the UK and the EU,” she said. “But we would get through it and go on to thrive. So we will be ready for a no deal if we need to be.” The prime minister again ruled out holding another referendum on EU membership in any circumstances, as pro-European campaigners continue to lobby for a so-called “people’s vote”. “To ask the question all over again would be a gross betrayal of our democracy—and a betrayal of that trust,” she said. However, May suffered a new setback Saturday in efforts to unite her fractious Conservative Party around the Chequers plan after an influential Remain-voting former minister who previously backed the proposal announced he now opposed it. Also writing in The Sunday Telegraph, Tory lawmaker Nick Boles said he “can no longer support this humiliation”. Meanwhile, allies of Conservative election mastermind Lynton Crosby—who helped May’s leadership rival Johnson win two London mayoral campaigns—are reportedly helping Brexiteers plot to destroy the plan, according to The Sunday Times. How quickly are you growing old? Myanmar now seeks donation for Rohingya!